Doesn’t our sin make God look good? 3:1 So what’s the bonus of being a Jew? Why bother with that painful ritual of circumcision? 3:3 But what if some Jews reject God? Will that stop God, and turn him into a liar who can’t keep his promises? 3:5 Here’s how some unbelievers might see it. They’d say that when we do something wrong, it shows that God is right, which is a good thing. So they’d ask why God would punish us for doing a good thing like that by sinning? 3:6 That’s no way to think. If that were true, how could God judge the world? 3:7 But some folks might keep on arguing that if their lie shows how truthful God is, why should they get condemned for lying? 3:8 Why not take it one step further? Some folks slander us by saying we do that. They say we teach that the more we sin, the better it makes God look. People who talk like that deserve what they get for it. 3:9 So what about Jews? Are we better off than other people? Not a chance. Jews are controlled by sin, just like everyone else is. 3:10 The Bible puts it this way: “No one is good. No one. 3:11 No one understands. No one looks for God. 3:14 Their mouth is an arsenal of profanity and bitterness. 3:15 Their feet rush them to victims they can kill. 3:16 Wherever they go, they ruin lives and leave people suffering in misery. 3:19 We know this much. The Jewish law is a law for the Jews. This law was intended to show them that everyone is accountable to God and that no one can talk their way out of it. 3:20 But we know this, too. No one can have a good relationship with God simply by obeying the law. All the law does is show us what we’re doing wrong. 3:21 Now we know how to become a good-hearted person who pleases God. It’s not by following the laws that Moses gave us. In fact, those laws and the prophets confirm this. 3:22 God accepts people who put their faith in Jesus the Messiah. It doesn’t matter who those people are. 3:23 Everyone has sinned. Everyone falls short of the honorable standard8 God sets. 3:25 Our sins are a capital offense, but God sent Jesus to take our punishment. Jesus bled10 and died for the sins we committed. Forgiveness is available for everyone who puts their faith in Jesus. 3:26 God sent Jesus into our generation to remind us that he’s a fair judge. He forgives those of us who put their faith in Jesus. 3:27 So, what’s there to brag about? God’s approval isn’t about keeping the law. It’s about keeping the faith. 3:28 Listen, God accepts us just the way we are. It’s because of our faith, not because we obey the laws Moses gave us. 3:29 Is God the God of just the Jews. Isn’t he the God of everyone else, too? He sure is. 3:30 There’s just one God of everyone. He’s going to accept the circumcised Jews because of their faith. And he’s going to do the same for uncircumcised non-Jews because of their faith. The writer of Genesis says God started drawing people to himself by selecting one man, Abraham, whose descendants became one nation, the Jewish people. Through the nation of Israel, God expected the world to become acquainted with him and with his expectations for citizens of his spiritual kingdom. In a sense, Jewish laws introduced the Jews to God and invited them to live their lives devoted to him. God told Abraham, “All the families on the planet will be better off because of you and your family. You are going to make this world a better place” (Genesis 12:3). God promised to do this through the Jewish people. New Testament writers claim that God fulfilled this promise by sending his Son, Jesus, born into a Jewish family. This phrase is from Psalm 5:9. It’s more literally, “Their throat is an open grave.” It’s unclear what Paul meant by that. But Jews became ritually unclean when they came into contact with the dead or with a grave. They weren’t allowed to worship at the Jerusalem Temple until they had gone through cleansing rituals. This included waiting seven days and taking ritual baths on days three and seven (Numbers 19:11-13). A more famous translation says “For all have sinned, and come short of the glory of God” (KJV). The “glory of God” could refer to the standard he sets for people who seek his approval and praise. But it could also refer to his presence, and the right to stand with him. The implication is that though he created humans, no one is fit to stand in his presence. Perhaps it’s much like John the Baptist once said of Jesus, “I’m not worthy to untie the straps on his sandals” (Luke 3:16). A more literal translation, heavy on abstract theological terms: “Justified freely by his grace through the redemption that is in Christ Jesus” (Mounce Reverse-Interlinear New Testament). Jewish law taught that sin was a capital offense that required blood to atone for the sin. In Old Testament times, animals were permitted as substitutes to atone for the sins of humans. Jewish law quotes God putting it this way, “Life is in the blood, and I have given you the blood of animals to sacrifice in place of your own” (Leviticus 17:11 CEV). New Testament writers present Jesus as the final sacrifice, ending the sacrificial system “once and for all time” (Hebrews 10:10 NCV). Some Bible experts say that Paul wasn’t teaching that Jews should stop observing the laws and traditions Moses gave them. Instead, he was saying that God, all along, had the rest of the world in mind, too. For Jews and everyone else, what matters most isn’t the law of the Jews. It’s the law of faith, which is what the Jewish laws were about as well—helping Jews learn to trust in God. Paul explores that further in Romans 4, when he reminds his readers that God approved of Abraham, the father of the Jews, not because Abraham obeyed the laws of Moses. Abraham lived several centuries before Moses. God accepted Abraham because of his faith. Paul starts Romans 3 by asking, “So what’s the bonus of being a Jew?” His presumption seems to be that Jews thought of themselves as a group of people one step above others when it comes to God. In other words, God gave them bonus points. Why do you think Paul would say something like that? 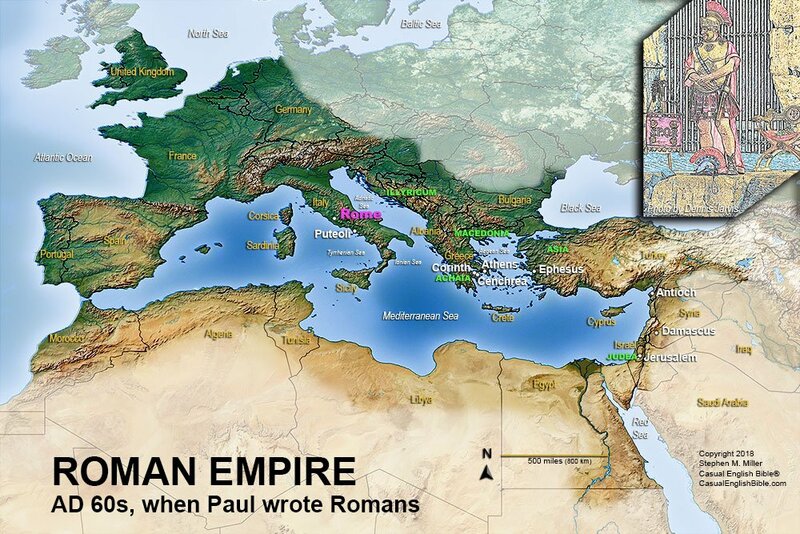 Paul set up a hypothetical argument that may have been based on what some critics were saying about the new Christian religion. Maybe even some supposed Christians were making the case, too. It goes something like this: “When we sin, it shows how much better God is than we are? So why would he punish us for making him look good?” Beyond rolling our eyes, how should we respond to that? My goodness, Paul has strong words to describe what sin does to us. Harsh, even. Take a look at his descriptions in Romans 3:10-18. If you had to describe the power of sin that you’ve seen at work, which of these descriptions nails it for you? Why do you think Paul uses such vivid word pictures to describe sin as he does in Romans 3:10-18? What’s the point of getting so worked up about it? Moses gave the Jews hundreds of laws that guided them in everything from personal hygiene to legal matters to religion. Paul says that obeying the law doesn’t make us acceptable to God. “All the law does is show us what we’re doing wrong” (3:20). That might seem like an exaggeration. For example, don’t we feel better about ourselves when we live within the law? Take a look at author Stephen M. Miller’s footnote to Romans 3:23. It suggests two ways of reading “glory of God.” Which version makes most sense to you? LIFE APPLICATION. Here’s one main teaching of Christianity that doesn’t seem to make much sense to people outside the faith: “Our sins are a capital offense, but God sent Jesus to take our punishment. Jesus bled and died for the sins we committed” (3:25). How would you explain why Jesus had to die and how on earth his sacrifice saves us from getting punished for our sins? LIFE APPLICATION. This is one of the powerhouse chapters in the Bible. Paul makes some bold statements. Bold enough to rattle the Jewish establishment but delightful enough to everyone else that there might have been some “Hallelujahs” shouted when the pastor in Rome read Paul’s letter to the congregation. What statement in this chapter resonates best with you or encourages you most?